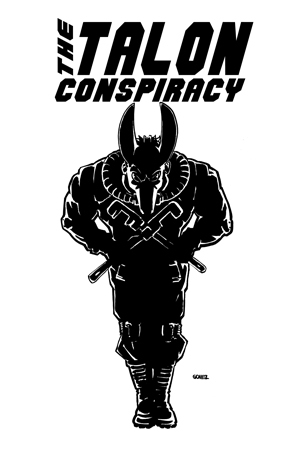 On November 16th 1997, nine years prior to the day that I turned myself in to federal prison in the SHAC 7 case, I was arrested in Anaheim, California. Activists from around the country had descended upon the home of Disneyland to protest the American Association of Laboratory Animal Scientists and we soon found ourselves facing a small army of law enforcement officers. They had miniature tanks, riot suits, pepper spray, batons, counter sniper units on rooftops, and a willingness to use all of the above to maintain the right of vivisectors to keep cutting open living animals. The demonstrations that day set in motion a chain of events that would change the face of grassroots animal rights in America. What does any of this have to do with No Compromise #8 and it’s insert? Allow me to explain. Freeman Wicklund was a vibrant, young activist from Minnesota. 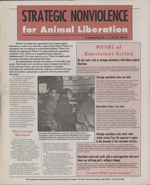 After animal rights militancy had been severely hampered in the late 80’s by grand juries, arrests, and the presence of informants, Freeman was one of the activists who had helped pick up the pieces. 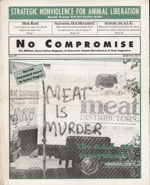 His organizing with Student Organization for Animal Rights had made Minneapolis a sort of mecca for direct action oriented vegans, and his projects in the early 90s included traveling to England to bring back literature, documentaries, and interviews about the strengths and weaknesses of the movement abroad. 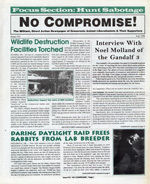 These materials proved to be very influential, and after a short period of contributing to publications such as Out of the Cages, Freeman started No Compromise magazine with a few friends. No Comp, as we called it back then, was the spark that lit a prairie fire. After its publication actions against animal abusers hit a fever pitch. The 1990s were a complicated time. On the one hand a lot of dedicated, sincere people were taking tremendous risks and making large sacrifices to liberate animals from harm. On the other hand, thrill seekers and status hunters wanted to make a name for themselves while having a little adventure. The epicenter of the latter phenomenon was Salt Lake City. The straight edge scene in Utah was notoriously violent and cultish, and it adherents had attached veganism to their gang-like mentality. Direct actions were on the rise in the area, but many of them were being performed by people who could care less about the politics. When Freeman visited the state in 1997 to help train young people to deal with grand juries, he found a movement based on bragging and scene points. Animals were secondary to climbing the straight edge social ladder, and snitching and self incrimination were epidemic. Disgusted with what he saw there, Freeman began reading the works of pacifist Gene Sharp, and slowly he began to have personal doubts about the role of sabotage and aggressive protest. Those private conflicts became very public in Anaheim. The AALAS protest drew hundreds of people from multiple states and ended in 8 arrests. While Wicklund was being arrested he began to shout that he was opposed to the ALF at a nearby camera which he mistakenly believed belonged to news media. (The camera was being operated by the police to gather evidence against the protestors.) While we were being detained in the Orange County Jail he told the other arrestees that he was a pacifist now, and upon his release he announced via e-mail lists that he would be quitting his job as editor at No Compromise. 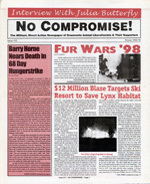 When issue #8 was released it contained an editorial announcing his departure, along with a 16 page insert that detailed the focal points of his new strategy. The supposed “violence vs pacifism” debate is unlikely to ever be resolved, but the contentious battles between the two sides of that argument can sure tear apart a movement. Freeman, for his part, was not content to simply let his views be known. 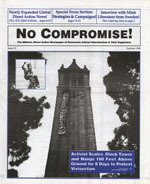 His actions now provide us with a clear road map of what not to do with tactical dogmatism; he began traveling the country denouncing direct action at conferences, he sent out press releases denouncing ALF actions, he even went so far as to visit and disrupt meetings of pro-direct action organizations, including Student Organization for Animal Rights, the group he once worked for. Many people who had been inspired by Freeman now could not decide where they stood and slowly drifted away. Actions slowed to a standstill as infighting raged and many activists just decided to flee the internal drama. By the start of 1998 the number of grassroots groups were declining and regional networks were falling into disarray. As time went on Freeman faded into obscurity. His activism became a hodgepodge of confusing moves like running for a school board position in Minnesota, giving equal time to the meat industry when he would table, and requiring that members of his group sign a pledge acknowledging that he was their leader. When his court date in the Anaheim case came around he skipped it to give a lecture about the failings of the Animal Liberation Front. I did show up for my court date, and was sentenced to 45 days in one of the most violent county jails in the United States. There, while on hunger strike, I rejected my own pacifist tendencies, and started down the path that would ultimately lead to my participation in the Stop Huntingdon Animal Cruelty campaign.